The type of wood is listed on the bottom of the box from the center out. On this box the wood is “Ziricote” from South America, “Pink Ivory” from South Africa (a wood that is sacred to the Zulu tribe). “Black Palm” from Indonesia. (I cut this on an angle to give the black dots a different look) “Lacewood” from Australia is a wood that has a nice coppery sheen to it. 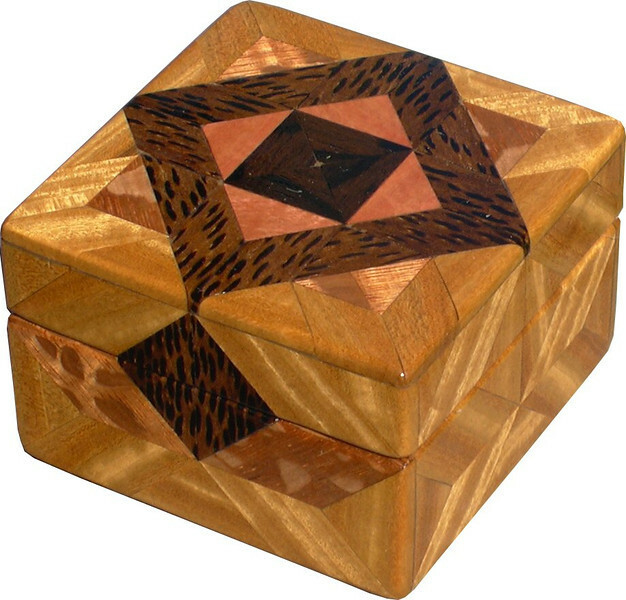 Then “Satinwood” from Sri Lanka is used on the main part of the box. Satinwood has the most beautiful golden satiny luster to it.